Fresh air is an excellent aid to sleep but how fresh is the air you breathe? If you live in a town or city the answer's probably 'not very'. And that's why the Silentnight Air Purifi er is such a good idea. 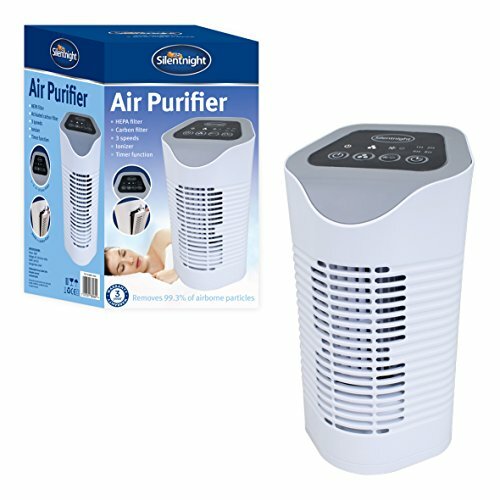 It filters the air in your room not once, or twice but three times, to remove 99.3% of the particles and impurities that can cause headaches, breathing problems or aggravate asthma. The 3-stage filtration process works like this: 1) A sponge fi lter traps large particles, dust and pollen. 2) A HEPA fi lter extracts smaller impurities. 3) A carbon fi lter removes ultra-fi ne particles - the sort that carry odours. Fitted with a timer and a sleep function (which switches it off during the night), the Air Purifi er has 3 speed settings and is almost silent in operation. Mains powered with 1.2m lead. Measures H35xW20xD21cm. Replacement 3-stage Filter available. Breathing pure, clean air - the secret of a great night's sleep. Filters the air three times. Removes 99.3% of particles and impurities. Fitted with a timer and a sleep function.